It was my second trip to Bangkok, and it was a short 4D3N with a couple of my friends and family who frequent there. I’ve read reviews and even my friends recommended me to try Ban Khun Mae. 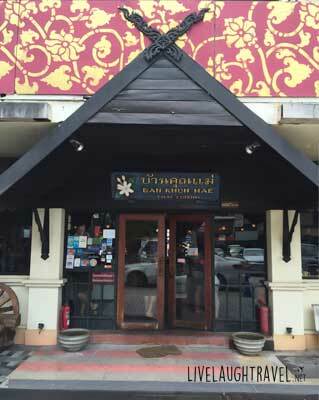 I was skeptical about the “they serve authentic Thai food”. Like c’mon when you’re in a local country you’d think that the street food would taste better than the dishes served in restaurants back at home. How authentic can a dish really be, and how do you exactly define authentic? Moreover, I was a fan of street food and I was totally satisfied with the Tom Yum Goong from the alley behind my hotel at Pratunam. But I kept my thoughts to myself, didn’t really set high expectations but went for it anyway on behalf of our Travel Blog. Being situated in the middle of Siam Square, you’d picture the restaurant being very classy and how you’ll end up paying much higher prices for local cuisines. But when I first stepped into the place, it was nothing like what I had pictured in my mind. The place has a really rustic feel to it. Nothing is modern or fancy about the interior, and I felt like I was in someone’s home for a meal. 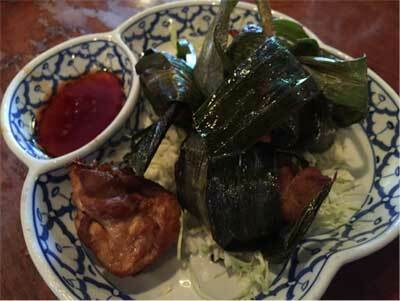 The menu was simple, serving the usual Asian favorite Thai dishes. We were a group of 6 pax, and we ordered a variety of dishes from the usual hot favorite, Tom Yum Goong, to the restaurant’s recommended Red Curry. 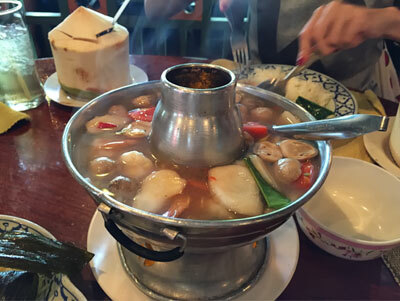 Their Tom Yum Goong was served in a hot pot and they were very generous with the ingredients. I personally thought that the soup was very flavorful, and it honestly had a good balance of spiciness and sourness. I love spicy food, but even though this soup is not as spicy as I would like it to be, its flavors bring you back for more. As it is not unbearably spicy, it definitely can cater to everyone. I’m no food critic but I absolutely enjoyed the soup! And even though I had more than an extra bowl of soup and there was still quite a fair bit of ingredients left in the pot after. 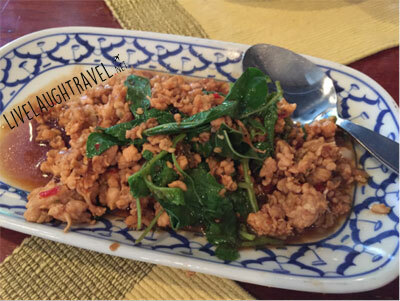 Thai Chilli Stir-fried Basil Chicken is my #1 favorite dish and this is one dish I really was looking forward to try after having my first bowl of soup. And boy was I glad it did not disappoint! The dish was well seasoned and the spiciness gave the taste bud a good kick. I absolutely loved it and would highly recommend you to order this if you’re visiting. To cater to those who can’t take overly spicy food, we ordered some Stir-fried Mixed Vegetables and Pandan-wrapped Chicken. 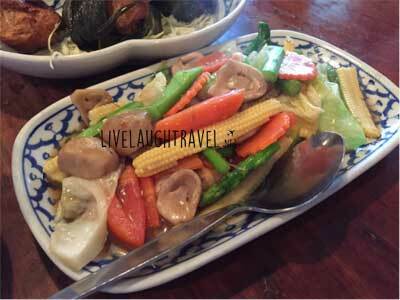 The vegetables were like a simple home-cooked dish. The price wasn’t unreasonable so there was nothing to complain about it. 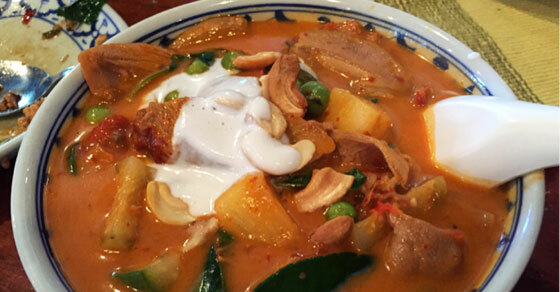 The last dish we ordered was a Chef’s Recommendation, Duck Red Curry. Well, I’m no fan of curry, whichever color it is or country its from. But since it’s a Chef’s Recommendation, I decided to take a spoonful and give it a try. Firstly, do not be intimidated by its color. I promise you, it’s not spicy. Secondly, the duck meat is simmered so well it practically fell off when I tried to poke my fork into it. Lastly, I am still not a curry fan, but I wouldn’t mind having this dish again when I’m visiting again the next time. So there you have it, tucked away in the bustling area of Siam, is a quaint little place that serves authentic Thai food at incredibly reasonable prices and recommended by Trip Advisor themselves. 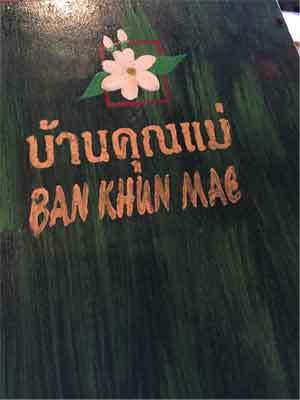 Having passed down and collectively kept secret recipes for generations, Ban Khun Mae is a humble place well raved by locals and tourists alike. It’ll be good to visit with a group of friends so you’ll be able to order more dishes and taste all the variety of dishes they can offer. Don’t forget to share this with your friends and subscribe to our Singapore Food Blog‘s Mailing list and Facebook to read about more articles like this!